The gaming industry has been growing faster than the movie industry in the past number of years and is occupying an increasing number of hours of time in a young person’s day. Many have argued that educational games have the potential to reach students outside of the classroom where some traditional educational methodologies are failing. Indeed, this genre of “serious games” has mushroomed over the past number of years. In order to better understand the impact and potential of such games, earlier this year, the World Bank decided to develop and evaluate an educational game focused on youth social innovation and development – Evoke: a crash course in changing the world. Evoke emerged from discussions with universities in Africa who increasingly wanted to find avenues to encourage their students to works with local communities and develop innovative solutions to local development challenges. The universities were searching for ways to engage students in real world problems and to develop capacities for creativity, innovation, and entrepreneurial action that many believe will be the engine for job creation now and in the future. Working with leading designers, Evoke was created to empower young people all over the world, and especially in Africa, to start solving urgent social problems like hunger, poverty, disease, conflict, climate change, sustainable energy, health care, education, and human rights; to collaborate with others globally; and to develop real world ideas to address these challenges. Players were challenged to complete a series of ten missions and ten quests — one per week, over the course of the ten-week game. The “text book” for this course was an online graphic novel written by Emmy-award nominated producer Kiyash Monsef with the art done by Jacob Glaser. 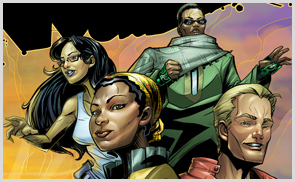 Set in the year 2020, the story follows the efforts of a mysterious network of Africa’s best problem-solvers. Each week, as players unravel the mystery of the Evoke network, they will form their own innovation networks: brainstorming creative solutions to real-world development challenges, learning more about what it takes to be a successful social innovator, and finding ways to make a difference in the world. By the time the EVOKE adventure ended, 19,324 people from over 150 countries registered to play, far exceeding expectations. Players submitted over 23,500 blog posts (about 335 each day), 4,700 photos and over 1,500 videos. The site received over 178,000 unique visitors and 2,345,000 page views with time per visit averaging over eight minutes. For the month of March, EVOKE generated just under 10% of what the World Bank’s entire external website generated with regard to page views (1.1 million versus 12.1 million). In fact, visitors to EVOKE demonstrated substantially higher levels of engagement than those visiting WorldBank.org, Kiva.org, or Unesco.org. Phenomenal numbers. Over the course of the 10 weeks, players posted ideas, found friends, commented on projects, shared information, rated the quality of the information shared, discussed, argued, created and acted. Librarians donated time to do research. Someone developed a wiki for the game. Teachers created their own online community within the game. Some players developed an online conference for sharing the best ideas. One player wrote a song about EVOKE. Others planted gardens. Based on the evaluation of the program, 60% of sub-Saharan Africans report that the game had a strong effect on “thinking big thoughts about the future” and 60% reported that the game influenced them to “start something new”. At the end of the game, 74 project ideas (known as ‘evokations’) were submitted and the top 25 projects qualified for a month long on-line challenge with Global Giving resulting in US$30,000 in additional funds raised. As an innovation and skills development tool, EVOKE has demonstrated enormous potential to create ideas; provide the social capital to move those ideas form concepts to reality; provide skills to execute those ideas; and link innovators to essential partnerships needed to grow those ideas. As a first foray into serious gaming, we were thrilled with the response, and we look forward to new ways to engage learners to improve their communities around the world. « What’s the Role of Gaming in Education? Written by Bob Hawkins on November 16, 2010 in Games and Education. I was an Evoke player and I want to thank you for creating the game. I also learned a great deal and I've applied it to creating a serious game for job hunters. I especially enjoyed some of the game design such as having people choose which of the different types of points to give to a blog post. It was a nice way to encourage just a bit of reflection and analysis without being too demanding. Based on what you learned running Urgent Evoke, what would you do differently in terms of game design next time? There were a lot of changes to the UI of leader boards/clouds in the course of the game. I'd love to hear more about why you made the changes you did and what effects you think the changes had. Urgent Evoke was created on the Ning platform correct? When I created my game I used the open source ELGG platform. What factors went into your choice of platform? Will you use the same platform for your next game? Too much to summarize here, but I encourage you to check out the post for our candid assessment. On the leaderboard, the design and technical teams — led by Jane and Nathan — did a phenomenal job of identifying unanticipated challenges and adjusting mid-flight. Early in the game, there were a small but determined set of players who were gaming the system to acquire status on the leaderboard. This distracted from the spirit of the game and demotivated a number of players who were coming a bit later to the game and were concerned that they would have no chance of "catching up". We wanted to recognize a wide range of contributions and types of skills and expertise among the community. Jane devised the innovative concept of the "leader cloud" which was fully endorsed by the team and implemented literally over a weekend (with an in-game Citizen X hack as the narrative explanation). The leadercloud worked incredibly well to motivate a range of players. On the platform, we went through a number of prototypes that simply did not have the collaboraiton, communication and social networking functionality that we wanted. Instead of custom building this functionality, we decided to customize around a platform which already had these features — Ning. Ning was a bit wonky and the technical team did an incredible job of pulling it all together. Nathan talks about some of the challenges in the above-mentioned blog post on lessons learned. Thanks again for your thoughts and interest in the game. I played this game (though I didn't find it until week 8!) and I loved it. I'm definitely hungry for more! I really loved the real world assignments & applications, and I'm excited for the future of this type of game. And I hope it comes soon, I would love to be involved with one again! Bob,As one of the billions of people who didn't get to play EVOKE, are there plans to have another session or to remake the game to be a continuous activity? I'd love to see this become a standard WB offering and not another great idea that stops at Interesting Pilot Stage without progressing into Game Changer Phase (pun intended). The opportunities for serious games are endless, and Evoke is just the tip of the iceberg. As mentioned earlier, with new (cheap) devices that will require much less connectivity for online interaction, the number of players (and hours played) will do nothing but grow exponentially. Any game could have an "educational" angle and at the same time keep the audience engaged, if well designed as Evoke was. Imagine a strategy game where you would actually participate in historical battles (with landmarks, terrain, army, etc.) or a sports game that would focus on the financial management aspect of sports clubs/franchises (from taking care of the balance sheet to doing an IPO or issuing bonds), all interactive and multiplayer… certainly would beat the hell out of the simulations I played in business school! Anyway, I am certain Evoke will continue inspiring many to develop these kind of games, and collaborate in the creation of new learning paradigms. Took me awhile to read all the feedback, however I really love the article. It proved to be very helpful to me and I’m certain to all the commenters here! It is always good when you cannot only be informed, but also engaged! I’m positive you had fun penning this article.